As the temperatures start to drop and winter weather approaches, this is the ideal time to make sure your porch or outdoor living space is well-protected. Winter storms can cause wind and water damage while freezing temperatures can damage plumbing. Keep these steps in mind when winterizing. If you have any water features outside, it’s important to make sure they’re covered during the winter. Putting a vinyl cover over these features keeps them protected from the elements which can damage their surface. Covers also prevent debris from building up in or on your water features and potentially damaging them. Keep in mind that you should make sure to shut off the water flowing to these features so that the pipes don’t freeze when cold temperatures hit. Wood structures such as decks, porch floors, and beams are at risk of developing wood rot during the winter months. These parts of your porch or outdoor living space can sustain water damage without proper protection. Even debris like fallen leaves can increase the risk of damage to these structures. You can protect them by clearing away any debris that’s fallen on them and sealing them to keep water out. When moisture gets into wood structures, it can cause them to swell and increase the risk of damage. 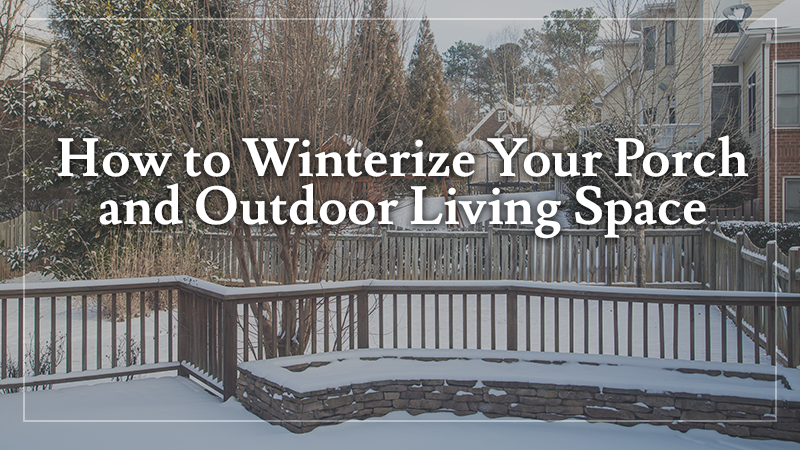 If your outdoor living area includes a kitchen, take steps to prevent snow and ice from causing damage. 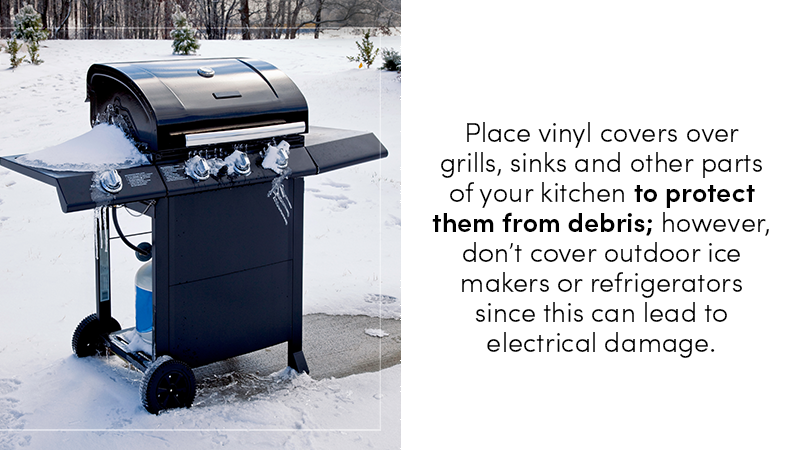 Place vinyl covers over grills, sinks and other parts of your kitchen to protect them from debris; however, don’t cover outdoor ice makers or refrigerators since this can lead to electrical damage. You should also make sure the power is shut off to all outdoor appliances while they are out of use. Apply sealant to countertops to protect them from the elements, and drain water lines to outdoor plumbing such as sinks and refrigerators to decrease the risk of pipes freezing and bursting. If you have outdoor planters containing delicate plants, move them to an indoor area or garage to keep them safe from cold temperatures and winter storms. You should do this before the first freeze arrives. If your planters are too large to be moved, you can protect plants by covering them with burlap which helps keep moisture inside all winter long. These coverings also protect your planters from damage caused by hail and other elements during winter. If you need help with your porch or outdoor living space before winter arrives, please contact L&L Contractors. You can also subscribe to our blog for more tips throughout the winter season.